1.25.17 -It’s my Sister’s 19th Birthday. I can’t believe how time flies that fast than I’ve expected before. Sadly, I wasn’t there at her special day celebrating together with the whole family. But then, I made something sweet just for her that will somehow serve as my presence at her special day.There are also a lot of photos that my friend took during her birthday which will remind me those memories at her day even when I am not around. At first I was thinking about making some cookies for her special day but I changed my mind,the moment where I am thinking to make something different which made me challenged. Through that challenge, I am thinking about baking a cake, a Black Forest Cake which is my Sister’s favorite cake. Rich, Flavorful and Mouthwatering- These three features that best describes my sister’s favorite cake that somehow I achieved in making it. It was my 9th time to bake a cake. I already encountered a lot of troubleshoots making them but then I am still trying to overcome them, which somehow I did. 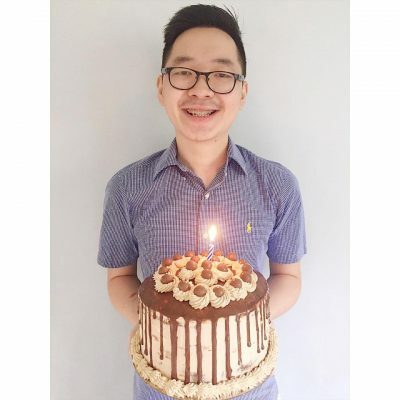 Honestly, I only make cakes for my family and I never sell them out because they were very costy , which is not on my standard when I sell some goodies.Here are some photos that my friend took during her birthday celebration in school. Feel free to check out my Black Forest Cake recipe as I share to you some techniques in making them. In a large bowl with a sifter, Put all the wet ingredient in to the sifter (flour,baking soda, baking powder,salt, sugar and unsweetened cocoa) and sift it until there are no lumps then use a whisk to mix the dry ingredient then it aside. In an another large bowl, Mix together the milk, eggs and vegetable oil until it is well-combined. Add in the dry mixture in to the wet mixture half at a time. Mix it until it is incorporated then add in the other half of the dry mixture with the same process. After mixing the wet and dry ingredients, Add in the brwed coffee slowly while mixing the batter constantly. Place the batter into the cake pans filling 1/2 of the pan. Place the first layer of the cake from a plate or turning table. Add the first filling by swirling around the top then use a scraper to spread the filling then add some cherry-pie filling around the top of the cake. Add in the second layer of the cake then do the second filling then scrape to smooth out. If there are excess filling from the side of the cake, just spread it on the sides of the cake. Refrigerate the cake for 20~30 minutes to firm up. When it firmed up, Add the filling at the sides of the cake then scrape it to smooth out. Coat the sides of the cake with some chocolate crumb cake then pipe some outline on the top and bottom of the cake using a star pipping tip. Pipe a swirl on the top of the cake then place a cherry on the top of the swirl. To finish it up, Surround the chocolate shards through the center of the cake.